The Civic Association in the Town of Palm Beach has been busy with its traffic consultants, committee members, and stakeholders in evaluating the West Palm Beach Mobility Study and Okeechobee Business District Plan. The Civic Association finds many flaws with the West Palm Beach plan. The Civic Association position, traffic consultant’s report, and letter to West Palm officials is included below. 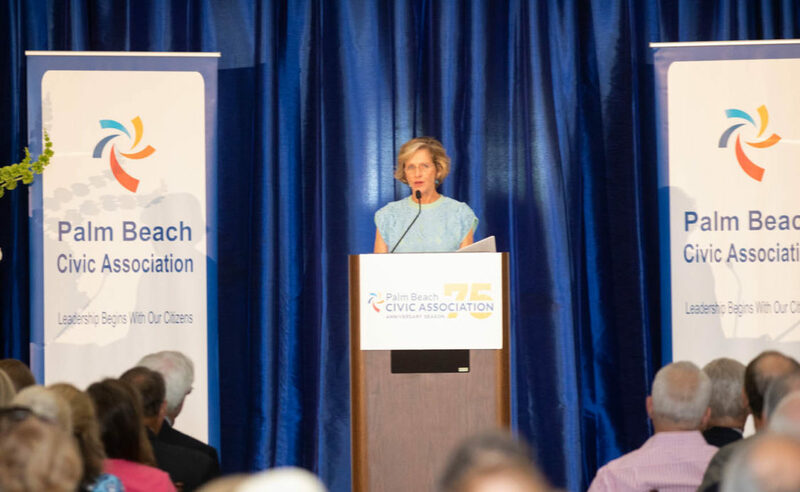 The Palm Beach Civic Association represents the residents of the Town of Palm Beach. We are writing to express our concern about the mobility study and the proposed Okeechobee Business District in West Palm Beach. The Okeechobee corridor is a principal route for getting on and off the island of Palm Beach. 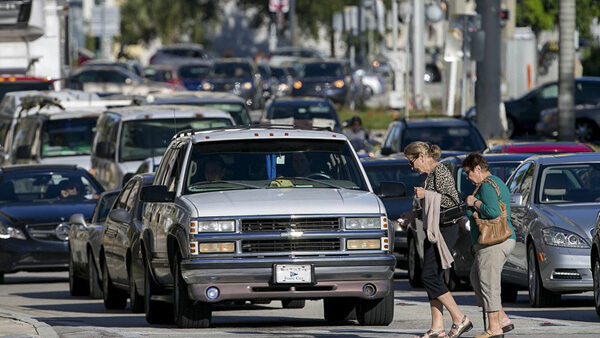 At all hours of the day and night, bumper-to-bumper traffic creates unbearable conditions for residents of Palm Beach and West Palm Beach, and visitors from surrounding communities. We believe the traffic woes on Okeechobee Blvd. will only get worse if the mobility study is adopted and a business district is created. Congestion and gridlock are sure to become the order of the day. To address these concerns, the Civic Association retained Hoffman, Weisman & Associates (HWA), a noted local engineering firm that specializes in traffic management and roadway design. We asked them to review the studies, attend the public meetings, and provide a professional assessment of the mobility study and the Okeechobee corridor. Their comprehensive report expressing serious concerns about Okeechobee Blvd. is attached [below]. At the Palm Beach Civic Association, we respectfully request that any zoning change involving the Okeechobee corridor be delayed until further detailed study is available. We urge you to vote “no” on the Mobility Study and the Okeechobee Business District. Palm Beach Civic Association, Inc.
HWA is pleased to Submit this current STATEMENT of findings of review of the Reference studies. Our research is ongoing and the attached documents and STATEMENT represent our recommendations to date. Hoffman, Weisman & Associates has reviewed the West Palm Beach (WPB) Mobility Study Findings Report of April 1, 2018 and related studies, and a recent Planning Board Study by Aponte and Greene. The following comments are based on the findings in the recent report that are not supported by any substantial data and analysis provided with the report. The Mobility report seems to predominate with streetscaping, how to remove lanes, magically reduce travel demand by 25%, and create yet another at-grade railroad crossing into downtown, and still fails to offer a regional approach to solving travel demand and congestion, particularly in the Okeechobee corridor. The City of WPB intends to develop and implement a ‘Mobility Fee’ structure to support the recommendations identified in the report for traffic operational and mode changes within the Okeechobee corridor between the ICW and I-95. It is the apparent goal of the City to ‘force’ drivers to seek alternative means or paths to traverse the Okeechobee and Palm Beach Lakes corridors during peak hours by removing lanes, increasing vehicle-pedestrian conflicts (particularly in the Convention Center area), and assert that bus-lane buses will attract riders when congestion becomes too excessive. If one looks at current efforts by the City, lanes are being removed from Dixie Highway south of Okeechobee. A recent proposal to remove lanes on North Broadway US 1 has been rejected by FDOT. Other recommendations in the report imply that the city can affect travel demand by raising parking fees, adding colored-asphalt pavement markings for bicycles and pedestrians, plant shade trees, and install way-finding signage at key locations around downtown. Other recommendations include improving some City administrative operations, parking facility amenities such as ticketing, lighting, way-finding signage, and increased security. Effectively, nothing has changed significantly from the review of the last draft from last fall. There have been no specifics provided as to how the City plans to attract 25% of traffic volumes away from the intersection of Okeechobee and Parker-Tamarind other than to simply remove lanes and convert to bus-only use. The report refers to ‘future’ parking to be made available west of downtown, but nothing specific in size, scope, or location. We wonder why escalators are not part of the plan, and the fact that elevators would be required in either case to accommodate handicap and elderly patrons. The report also states “… that because of the crossing needs across Okeechobee, the safety issues, and the costs, a pedestrian bridge across Okeechobee is NOT recommended…” This makes absolutely no sense. The report identifies primary corridor users as vehicles, transit, pedestrians, and bicyclists. To the best of our knowledge and experience, removing conflicting movements competing for the same space, can be effectively achieved by separating them. We believe a pedestrian bridge(s) would benefit all users. In conclusion, the report states “…none of the bridge options are able to handle high volumes of pedestrian crossings or reduce crossing time…” While this is possibly semantically true, limiting their options to these specific bridge-types seems deceptive. Finally, it is possible to eliminate both stairs and elevators if the bridges were tied directly into the connecting facilities (including sufficient access) that would allow the use of existing elevators, escalators, and stairs within those facilities. When looking in the report (pg. 61 Okee report) at the visual depictions of what the various layouts/designs for pedestrian bridges could be, none of them seem functionally reasonable, and could thus meet the stated rejection criteria. However, direct pedestrian overpass(es) between high-demand centers is extremely feasible; and, would do more to improve safety for all users and allow for consistently reliable crossing Okeechobee day or night during any peak traffic period. The County recently passed a ½ cent tax dedicated to transportation. This could be a reliable source of funding, especially if private participation could be accomplished. During the charettes, one option to mitigate congestion along Okeechobee was to tunnel Okeechobee in varying lengths and identified as the ‘Long’, ‘Medium’, and ‘Short’ tunnel options. While the report rejects any of these options, we would support the ‘Long’ tunnel concept; the segment from west of the CSX (Parker/Tamarind) to just west of Dixie (between Quadrille and Dixie). This design would include retention of surface frontage road to provide local access along Okeechobee. It is ironic that the study’s rejection of this concept is based on the following statement (pg. 58-59 Okee report): “…The increased complexity of the intersections would add travel delay along the corridor at the intersections where the tunnels start and stop…” And, “…The majority of the delay along the corridor during the peak commuting periods is associated with turning movements to or from Okeechobee to Tamarind, Sapodilla, Rosemary, Quadrille, and Dixie…” And, “…These turning movements would be more delayed with the tunnel options…” We find this quite fascinating since the tunnels would have removed all the high-volume through-movement traffic out of the paths of turning movements. And, such that all the delay attributed to CSX and FEC stops and queuing and the resultant improvement in safety and accident reduction, some how do not compensate adequately for somewhat debatable intersection delay at the tunnel ramps. We believe that the cost estimates for tunnels and pedestrian bridges are probably too high based on the comparative locations (length of proposed bridges and tunnel cities of Dallas and Philadelphia). When reviewing identified Primary and Corridor Projects (pg. 118+ Mobility Report), ‘Project Notes’ identified virtually all projects require ‘Future Study’, and only a few have funding ‘committed’. It seems strange that the Okeechobee corridor report identifies various stakeholders but does not include FDOT or Palm Beach County (other than convention center management). Yet FDOT and PBC, through the TPA (formerly the MPO), are a significant source of funding for major roadway and transit projects. It is most likely because the report rejects tunnels or pedestrian bridges. The proposed TDM is similar to the existing TDM program in place since 2002 (Called TMI). They are very similar plan. The existing plan has been shown in the Sam Schwartz Study to be ineffective in causing mode choice to occur and thus automobile travel still dominates WPB. Conclusion: The current TDM plan has not worked, therefore we have no evidence that the proposed TDM will work to reduce traffic either. The study suggests raising parking rates, not building any more parking in WPB, or setting minimum and maximum requirements on new developments. The TDM is a tool that WPB planners Greene and Aponte claim will reduce traffic and therefore will make the OBD compliant with WPB transportation polices. Assuming TDM will work on an Okeechobee Business District is too optimistic, as we see no success for the existing TDM in place today in WPB according to the City of WPB’s own consultant, Sam Schwartz. Today in 2018 we have 6753 units residential, 10,000,000 sq. ft. (approx.). non-residential. Clearly the assumptions of old have not come to fruition. The original set of growth assumptions for this policy to shorten trips are probably no longer valid. The current development pattern has contributed to the 1 percent steady traffic growth curve on Okeechobee seen over the last 20 years. In summary, the original growth pattern balance assumed by planners back in 1995 for the 1995-2010 planning period did not come about by 2018. The report by Aponte and Greene relies on the old assumptions of 1995-2010. Flash to 2018 and we have a clear imbalance of remaining residential units of 502 units to balance or rather un-balance with 5,000,000 sq., ft, potentially in the OBD. It appears Aponte and Greene need to add substantially more residential units to balance out the equation and reduce trips in the future. How many Units? Even lower rent-controlled units may be necessary. They need to go back to the office and figure that out, and amend the study accordingly. Finally, we have included two Word documents that summarize our review of the TDM portion of the study. The first document, “Transportation Demand Narrative Summary”, identifies key observations regarding the report. The reference numbers are summarized and identified in the companion Word document file “TDM Highlights 1.0”. Executive Summary: The City of WPB cannot reduce vehicle travel demand using Parking Management in the near or foreseeable future. Organization, operation, cooperation, financial and technology changes are required. • The Automobile remains the cheapest form of travel to WPB, favored by employees, encouraged by employers. 8) Palm Beach Atlantic University (PBAU) accounts for a large portion of the parking inventory and demand in the study area, particularly along the southern portion…. This shows that there is a total of 1,538 spaces split between visitors, students, employees, and residents with prices ranging between $0 and $300(P.14, Last paragraph). 9) Currently, PBAU leases 457 of their 1,538 spaces from several institutions in the immediate surrounding area including the Family Church, Memorial Presbyterian Church, and Church of Christ Scientist. Despite this, PBAU has found that student parking is maxed out on a daily basis, with spillover occurring along the campus’ residential streets and commercial parking lots, particularly those that are free of charge. (P.15, 2nd paragraph). 10) As the seat of Palm Beach County, a large portion of WPB’s commuters are City or County employees, jurors, litigants, attorneys, witnesses, trial observers, media, and other visitors parking in one of the County’s seven facilities located within the study area. The County’s parking facilities include the State Attorney and Public Defender Staff Parking Lots, the Government Center Garage, the Judicial Garage, and the PBC Department of Community Services parking lot. Public Parking is available in a portion of the State Attorneys and Public Defender Parking Lots, the Government Center Garage, and the Judicial Center Garage/Lot. (P.15, 4th paragraph). 11) The Convention Center includes multiple venues, for a variety of local, regional, national, and international events throughout the year. Although the Convention Center recently constructed a 2,651-space garage, it has been operating with 1,100 spaces for the past five years. During this time, spillover parking demand was coordinated with, and absorbed into, Related Group’s nearby CityPlace garages and elsewhere in the vicinity of the site. (P.15, 7th paragraph). 12) The Convention Center has long-term plans to construct a major expansion which would provide them with more space to host larger, international events on a more frequent basis. If the parking demand of the Convention Center is diminished due to more national/international attendants staying in a nearby hotel and walking to and from the Convention Center (as opposed to driving and parking), there is an opportunity for the Convention Center to maximize the use of its large parking facility by sharing spaces with the City, PBAU, or other private entities. (P.16, 2nd paragraph). 13) For those who know it well, WPB’s parking lots and garages are familiar destinations that cannot be missed. However, to the untrained eye, many of the City’s parking assets may go unnoticed. Gateway and wayfinding signage is an effective tool to welcome and direct visitors to key parking destinations. (P.16, 4th paragraph). 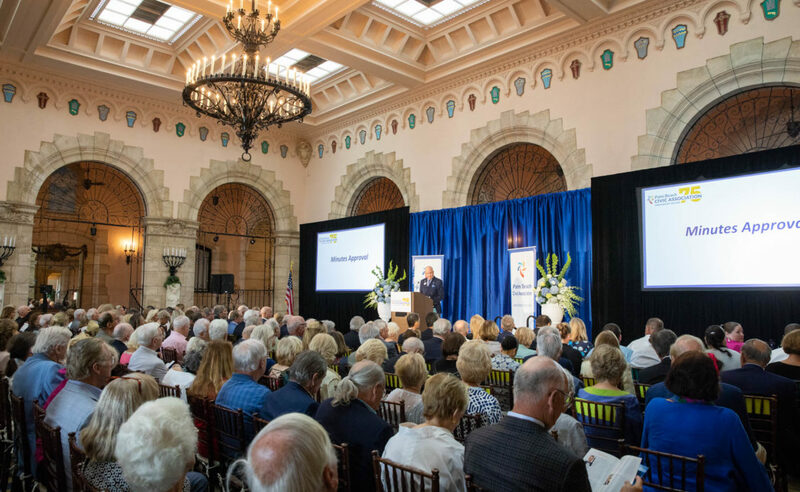 14) The time, date, and venue of event requests is coordinated by an events committee, who meets on a monthly basis to approve and schedule events throughout Downtown West Palm Beach. The events committee includes representatives from the City’s Traffic Engineering, Police Department, the Event Coordinator, and several other departments; the Parking Administration is not a part of this committee, nor are private parking owners/operators. However, a representative from the City’s event coordination team informs the Parking Administration of the date and approximate number of attendants for each event, which (along with historic vehicle numbers) is used to determine if and what the increased event parking rate will be. (P.18, 4th paragraph). 15) Parking demand patterns were analyzed through two primary methods: (1) the historic revenue gained from the City’s parking assets and (2) a system-wide utilization survey completed on Tuesday, April 18th, 2017 between the hours of 10:30am and 1:00pm. This time was selected as it was identified as the typical peak period of demand by City staff and the Parking Administration. (P.18, 5th paragraph). 16) Although the system-wide on-street utilization rate is 67%, specific areas experienced high demand. This includes the eastern portion of the Clematis Street, the southern portion of Rosemary Avenue, and street segments within Palm Beach Atlantic University (PBAU). Each of these areas displayed a utilization rate of 91% or greater, exceeding their functional capacity. (P.21, first paragraph). 17) The effective and efficient turnover of convenient parking spaces is most successful when the facility reaches an 85% occupancy rate, meaning that 10% to 15% of spaces are not occupied at any given time and are available for incoming parkers. (P.21, 2nd paragraph). 18) The Parking Administration manages its on-street parking demand by implementing demand based parking rates, ranging between $0.00 and $1.25, depending on the location of the meter. The goal of these rates is to ensure that spaces along high demand corridors are available for incoming short-term visitors, while encouraging long-term parkers to locate along street segments in the periphery of Downtown WPB, where demand is lower. (P.21, 3rd paragraph). 20) The overall utilization of publicly available facilities owned/operated by the Parking Administration and privately owned/operated was 62%. However, specific facilities displayed high demand, including the Tri-Rail lots West of Tamarind Avenue, CityPlace’s Rosemary Lot, the Banyan Garage, and the Evernia Garage. (P.24, 1st paragraph). 21) To gain a better understanding of the Downtown’s parking demand system-wide, the Sam Schwartz team also surveyed and recorded the utilization of off-street parking facilities designated for other user groups including student, customer, and employee/customer lots, which can be seen in Figure 13. (P.25, 1st paragraph). 22) with the County informing the project team to “assume no publicly available spaces for planning purposes” in several of their facilities including 810 Datura Street/PBC Department of Community Services, the State Attorney and Public Defender lot, and the newly constructed Convention Center Garage. (P.26, 1st paragraph). 23) The overall utilization rate of the facilities that were examined is 74%. While the majority of facilities examined displayed a demand rate ranging from 0% and 70%, several exceeded their functional capacity, including facilities along Fern Street associated with Dreyfoos High School and parking assets south of Okeechobee Boulevard associated with PBAU. (P.26, 2nd paragraph). 24) While there were several facilities whose utilization rate exceeded their functional capacity (85%), the overall demand of the examined parking facilities within the study area was 66%, indicating that there are opportunities within the system to absorb excess demand without constructing additional supply. (P.26, 4th paragraph). vehicles that entered the City’s garages for various events between 2010 and 2016. The total number of recorded vehicles in the City’s garages for events between 2010 and 20166 is presented in Figure 14. (P.26, last paragraph). 27) WPB zoning code has a number of progressive parking policies and regulations that are options, but not necessarily requirements. While WPB did establish parking maximums, these ratios are slightly higher than traditional standards throughout the country which allow incoming construction projects to overbuild parking and result in sprawled development patterns. (P.29, last paragraph). 28) Apart from blocked-off street segments, the metered parking assets exceeded a 91% utilization rate; the system-wide utilization rate was approximately 80%. Similar to the previously discussed event parking section of the report, this would indicate that event parking management policies should focus on effectively communicating and distributing parking demand and traffic flow, as opposed to constructing additional supply (P.27, last paragraph). 29) Multi-Modal Analysis: Trolley, Yellow Line annual ridership of 386,000 today, Green Line. 199,118 passengers annually, Blue Line24,064. (P.30, 2nd paragraph). 30) Palm Tran. Route 1 is the most frequent, running every 20 minutes during its peak hour. It also has the highest ridership of approximately 188,838 passengers annually, or 24.6% of the overall system. (P.31, 1st paragraph). 31) Tri-Rail. with 332,000 boardings and 373,000 alightings at the West Palm Beach Station alone. (P.31, 4th paragraph). 32) Brightline High Speed Rail. Brightline is a privately owned and operated intercity passenger rail service anticipated to begin passenger service in 2018. (P.31, 7th paragraph). 33) Bikeshare. SkyBike is the premiere bikeshare service in WPB. SkyBike launched in June 2015, and is sponsored by SkyBridge Capital, P3 Global Management Inc., as well as the West Palm Beach Downtown Development Authority, and operated by NextBike. There is a total of 150 bikes distributed among 13 SkyBike stations throughout WPB, as seen in Figure 18. 34) Car-share. Zipcar carsharing services have been available in Downtown WPB since 2015, with two vehicles along the Evernia Street; and two vehicles south of Okeechobee Boulevard in proximity to Palm Beach Atlantic University, as seen in Figure 19. (P.32, 2nd paragraph). 35) The WPB’s Transportation Management Initiative (TMI) was established in 2002 by City and County leaders, as well as representatives of the FDOT and the Downtown business community, with the goal of providing education about alternative transportation modes and other programs to reduce vehicle trips in the Downtown area. (P.33, 3rd paragraph). 36) To gain interest in alternative transportation modes, the TMI conducts outreach to employers, targeting larger employers that would have a larger impact on the Downtowns overall mode split. Generally, the TMI Program Administrator distributes a survey to employees which determines what their most (and least) preferred parking alternative is. This survey includes questions regarding interest in carpooling, arrival/departure times, residential locations, and daily commute patterns. Based on this data, the Program Benefits coordinator determines what the best programs for that specific employer will be and works closely with each company’s human resources department to implement and oversee these programs. (P.33, 6th paragraph). 38) There is a significant amount of development occurring in Downtown WPB, but little coordination and transparency in establishing shared parking agreements or facilities between developers, public entities, and the Parking Administration (P.34, 3rd paragraph). 39) There are several transportation benefit programs available to employees. However, most employees do not use them because there is an absence (or lack) of internal marketing/promoting and “99% of parking is bundled into lease agreement”. (P.34, 6th paragraph). 57) Mobility services like Uber and Lyft are contributing to less parking and more pick-up/drop-off space. (P.43, last sentence). 58) “. more than half of the public parking in the study are is privately owned, making it difficult for the City or the Parking Administration to predict or influence parking behavior.” (P.46 4th paragraph, 2nd sentence). 59) “The formation of a public parking committee would provide its members with an opportunity to share data, best practices, and event calendars, and initiate shared parking when needed.” (P.46 4th paragraph, last sentence). 60) “..the City’s on-street parking system is managed by two separate PARCS providers and the off-street parking system is managed by three separate PARCS providers, making it significantly more difficult to receive, track, and record parking demand patterns system-wide” (P.46 last paragraph). 61) Based on this study’s analysis, there is adequate parking through 2030. And if aggressive TDM strategies are pursued, there will be adequate parking through 2039. Meaning, that it is not necessary to construct additional parking facilities, but rather to invest in balancing the existing parking demand throughout the system and promoting the use of alternative transit modes. (P.48 4th paragraph). 62) Uber and Lyft have increased substantially over the past five years and driverless cars are being tested throughout the country. As the adoption of these—and other—trends continue to develop and become more common, the demand of off-street parking will significantly decline, while the demand for high-turnover pick-up/drop-off space will significantly increase. (P.48 last paragraph).